Curry is one of the most comforting flavors in the world. One taste immediately conjures memories of my favorite dishes from Thailand and India. Curry— which typically consists of turmeric, coriander, cardamom, cumin, sweet basic and red pepper— is also a healthy way to bring dynamic flavor to a vast array of vegetarian and vegan dishes. Turmeric has become increasingly popular as an anti-inflammatory, meanwhile, cumin, a dried seed from a plant that is a member of the parsley family, aids in digestion and has a bit of iron to boot. Make one batch of this meal for your family dinner, or double the batch so that you can have leftovers for the week to use as a quick and easy lunch or dinner option. Carrots are rich in fiber, beta carotene (vitamin A), vitamin K and manganese— which contributes to healthy bone structure and vision. Celery adds an extra dose of vitamin K and folate. Vegetable broth is warm and soothing— and comes with tons of vitamins and minerals. Make sure to select a sodium-free version at the supermarket. Coconut milk is what makes this meal— it adds a delicious, creamy texture and adds healthy fats into the meal which will help you feel satiated. 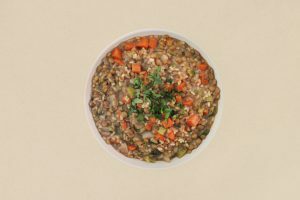 Lentils and brown rice add additional fiber and nutrients to this already delicious meal. Spice things up with curry powder, and if you want to make a truly spicy adult version for yourself, split the pot and add in some red chili flakes or cayenne pepper and salt to taste. 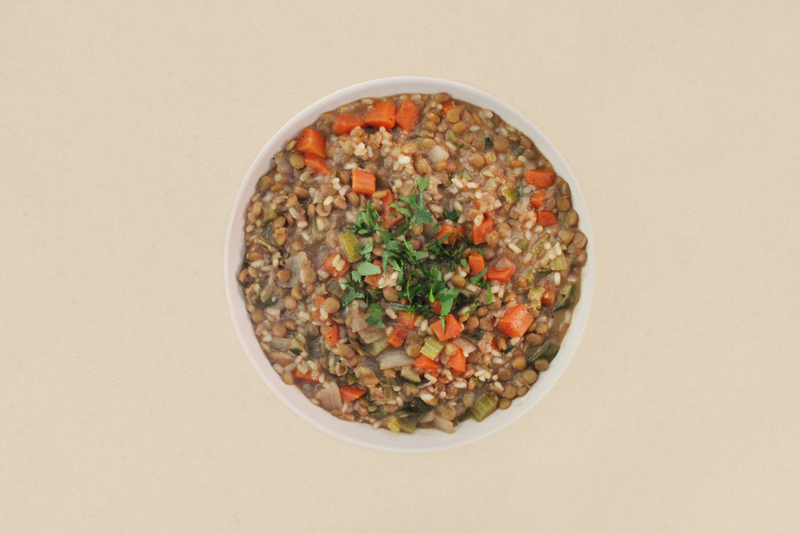 Warming and nutritious, our Coconut Curried Vegetables + Lentils will satisfy all your cooler-weather cravings. It’s perfect for you and baby - and it’s a great dish to make ahead of time to serve as a mid-week time saver. In a large sauce pan, combine diced onion and olive oil or coconut oil. Sauté for one minute, until onions begin to soften. Add in diced carrots and celery, and sauté for 3-4 minutes, until all of the vegetables have begun to soften. Pour in vegetable broth and coconut milk, and heat for 2-3 minutes. Add in green lentils, long grain brown rice, curry powder, salt and pepper. Mix well. Over low-medium heat with a lid on the pot, allow the mixture to simmer for 25-30 minutes, until the veggies, lentils and rice are soft and tender. Stir occasionally. Hi, I’d like to make this recipe and wonder what kind of coconut milk – from a can or a carton? Great question! You can use it from a can or carton – whichever you prefer! We used a can in this particular recipe. How much will this make or how many will it serve? Is this a baby and me friendly recipe if I were to purée it?